Reflects the curious Ptolemaic convention of a landlocked Indian Ocean. 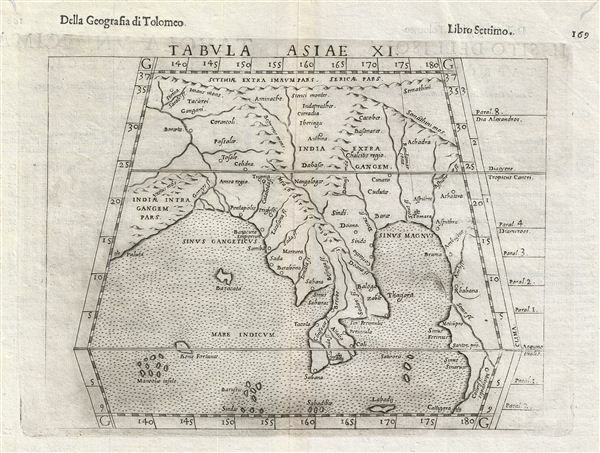 This is an uncommon 1588 Ptolemaic map of Southeast Asia and the Malay Peninsula issued for Girolamo Ruscelli's Italian edition of the Geografia di Tolomeo. Cartographically Ruscelli based this map on interpretations of Claudius Ptolemy's Geographica by Bernard Sylvanus and Sebastian Munster. a habitat of tigers and elephants . . . lions and robbers and wild men who live in caves, having skins like the hippopotamus, who are able to hurl darts with ease. Between India and Malaya the Island of Bazacata most likely represents the Nicobar Islands. Ptolemy comments in his Geographica that the people of this island do not wear clothing; a convention commonly associated with the Nicobar Islands and reported by numerous travelers including Marco Polo, as well as Arab and Chinese navigators. The islands further south, Bone Fortune, Maneolae, and others, were believed to be highly magnetic such that the nails would be pulled from passing ships, causing them to sink while the hapless crews were devoured by the indigenous anthropophagi. This map's most intriguing element is the southward extension of land running along the eastern edge of the map and extending beyond the border. This landmass reflects speculation, inspired by Ptolemy, that the Indian Ocean was landlocked. It was believed that this landmass extended far southwards before turning westward and connecting with eastern Africa. Though the exploits of Vasco de Gama and Magellan had proven that the Indian Ocean was not fully land locked, it was believed that a large tract of land, possibly even America, attached to Asia west of Malaya or the Cheronesus. Thus the 'Great Promontory' or 'Dragon's Tail' that appeared on many maps of this region well into the 16th century. The City of Cattigara, located here in the bottom right corner of the map, is cited by Ptolemy as southernmost known point. There has been considerable debate about the true location of Cattigara, certainly Magellan and the other great navigators failed to identify it, with some attaching the name to Hanoi or South China and others placing it on the shores of South America. Be as it may, the Ptolemaic model retained a great deal of influence well into the 16th century until Portuguese and Dutch navigators more fully explored the region. A fine, collectable, and early piece essential for any serious collection focused on the cartographic emergence of Southeast Asia in European maps. Published in Girolamo Ruscelli's Italian 1588 edition of the Geografia di Tolomeo. Ruscelli, G., Geografia di Tolomeo, (Venice) 1599. Very good condition. Some restoration to upper left and right margin. Else a fine example with a crisp dark impression. Curtis, R. and Durand, Fr. Maps of Malaysia and Borneo: Discovery, Statehood and Progress, no. 2. OCLC 7470062.